What makes a great team? Four years ago, Google announced it had the answer. The tech giant said its research showed personality types were not as important as setting a clear framework to support a team. On revisiting its findings, Google sparked a new debate about how teams really work. A recent article in the Harvard Business Review (HBR) disagreed with the Google research, asserting that personality types were still key to building great teams. Dave Winsborough, head of personality profiler Hogan X and Professor Tomas Chamorro-Premuzic, Chief Talent Scientist at staffing firm ManpowerGroup, said in the article that Google was arguing success depended on a team’s collective level of emotional intelligence and good communication. “Google’s recipe of being nice and joining in makes perfect sense and is hardly counterintuitive,” they said. “Perhaps more surprising, Google’s research implies that the kinds of people in the team are not so relevant. The authors said in their experience, teams rarely perform at maximum capacity because most of the models devoted to creating high-performing teams focus solely on skills and experience, and ignore the influence of personality. 5. Impact - belief that the work makes a difference to an organization’s goals and will bring about change. 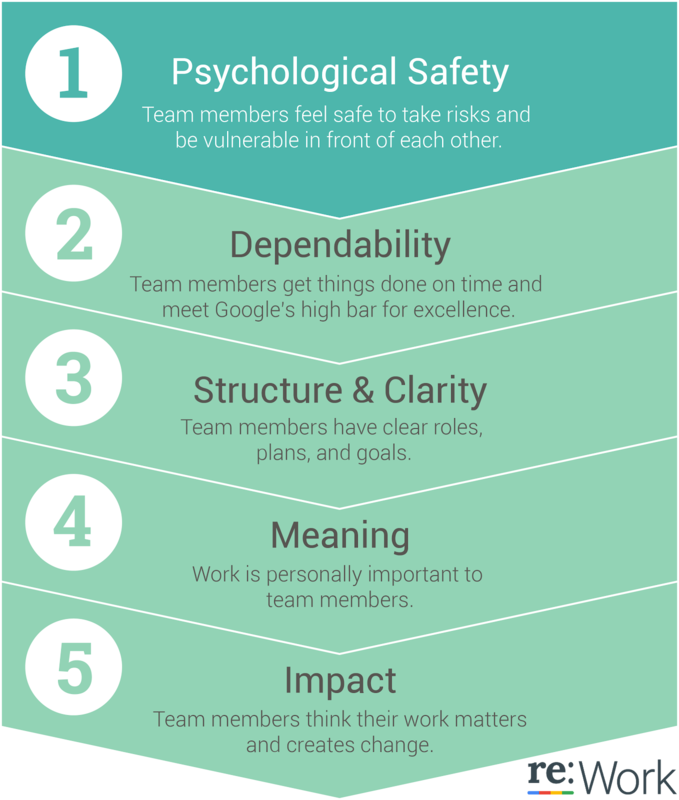 Google says the most important of its five dynamics is psychological safety. The research found teams with high scores for psychological safety exceeded sales targets by an average of 17%, while those with low ratings fell short by as much as 19%. There is a plethora of psychological tools out there to help managers understand the traits of their people and combine them for maximum effectiveness. One of the first was the Myers-Briggs Type Indicator, developed in the first half of the 20th century by mother and daughter team Katharine Cook Briggs and Isabel Briggs Myers. Based on the ideas of Swiss psychiatrist Carl Jung, they built a tool that defines an individual’s personality traits using four categories. Like the later Belbin Team Roles, developed by an academic at the UK’s Henley Business School, the idea is that if people have a better understanding of their colleagues’ personalities they will be able to play to their strengths as members of a team. Bernadette Wightman, Managing Director, Global Services, BT Group emphasises the role of business leaders in building strong teams. Speaking at the World Economic Forum Annual Meeting in Davos this year she said leaders were defined by the quality of their teams. Leaders must coach and mentor teams and avoid corporate speak if they want to raise engagement. “It’s never the wrong time to build the right team. As leaders, it’s our responsibility to attract the very best people to create a team that’s greater than the sum of its parts,” she said.